To Vacation or Not To Vacation . . . . . That Is One Question? But, not the only one. The bigger question is what is the real Co$t of that week away? The article below discusses 3 questions to answer before deciding to go on a vacation. It’s that time of year. Friends, families, colleagues . . . well, it seems everyone is going on vacation. What about you? The idea may be tempting, especially if those friends, family members, and colleagues are pressuring you to take some time off. It may be even more tempting if you’ve been working at your search for several months, and are feeling discouraged if you have not yet landed a new job. Or you may have recently started your search and are wondering if taking a week or two away could really hurt. In either case, there are things to consider besides you take a vacation, so answer the three questions below before you make your decision. Question 1: To Vacation or Not To Vacation? Like the December holiday season, summer is a tricky time of year for job seekers. It can be a challenge to keep your search moving forward when the people inside companies you need to meet are unavailable. Some job seekers believe it makes sense to stop searching for awhile, and start back up again in the fall. However there is a cost to doing so. Job seekers who take time away lose the advantage that job seekers who keep going gain. Many of your competitors will choose to slow or stop their search entirely for awhile, unknowingly making for fewer people competing for positions. So keep on networking, applying, and attending. While it may take a little longer to secure those networking meetings or interviews, by staying in the game, the advantage is yours! Question 2: The REAL Co$t of that Summer Vacation? It gets frustrating when it seems everyone you need and try to meet is unavailable. Everyone you call is . . . you guessed it . . . on vacation! So, what's a job seeker to do? Might as well take a week off and go on vacation too. After all, it’s only a week! Right? Why? Because that week off will actually cost you 3 ! In reality, that week off – and away from your search – will actually cost you three! Yes, that's 3 - weeks away from your search. And, probably more! 1. 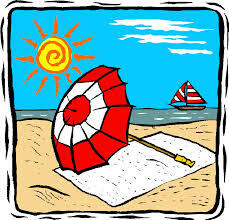 First, there is the week (if not more) before your vacation that you spend getting ready to go on vacation. 2. Second, there is the week of your vacation. 3. Third, there is the week after your vacation which you spend trying to get back into the swing of hunting for a new job. What happens during that 3-week period that slows your search? 1. You fall out of the productive habits that you painstakingly put into place to organize your job-search-business day. 2. You begin to fall off their - your network's - radar screen. 3. Your pipeline begins to dry up. 4. The biggest cost of all - lost opportunities!
! Takes you out of the geographic vicinity if an unexpected interview happens to pop up!
! Feeding your pipeline, the "life line" to finding that next opportunity, slows or stops altogether! Remember, you generate leads to jobs and people by your daily - that’s daily - job search activity. So before planning that trip, consider the REAL COST of time away away and decide if time away is worth the cost. Question 3: Vacationing Anyway? - Then Be Smart About It! Determined to take a vacation anyway? Then at least be smart about it. Research the area you’ll be visiting. Identify prospective employers, staffing firms, and network contacts who can be helpful to you in providing leads to opportunities - in either the geographic area of your vacation or back home in your home town via their long-distance contacts. Contact them ahead of time and try to set appointments while you’re in their geographic area. This works! I have a client who did just this while vacationing. He found a job in his own hometown, but able to relocate to the area he had vacationed in (a preferred area) when an opportunity arose two years later! Keep your search going back home. Advise hot employment prospects that you will be out of the area for “ __X__” period of time, and attempt to step up your interviews for the week after you return. But, who knows - you might get an offer using this technique, before you vacation (which is the best way to vacation, isn’t it!?). Network from afar. With today’s technology, you can network via your computer and phone from whatever corner of the earth you’re on. So, set aside a part of each vacation day – maybe an hour or two in the early or late hours of the day – to stay in touch and connected! We've all experienced it - that freedom you feel during the time between finishing one job and starting the next. Choice 1: Your job search is your job right now. And, you can experience that same sense of freedom if you delay that vacation until after you have received your next job offer but before you've begun your new job. And you'll have a lot to celebrate! Choice 2: But, if you prefer not to delay, or have travel plans that commit you to travel -mid-job search, be smart about advance planning so that you search is still viable when you return from your vacation. The choice is your. Whatever you decide, plan and take pains to keep your search momentum moving forward. Either way - have a great vacation!